This is the online preview of this present issue of Deer Tracking. The professional glossy print version of Deer Tracking will look much different and will be mailed to subscribers as a colour, full size magazine. Those who are part of the print version of this issue ALSO are showcased (with links to their websites) in this format here AND on our facebook page www.facebook.com/DeerTrackingMagazine/ . Check it out, give our advertisers a call! Thank you to all (advertisers, writers and readers) who continue to help make Deer Tracking one of the longest running magazine resources in the industry, 21 years in the deer industry! 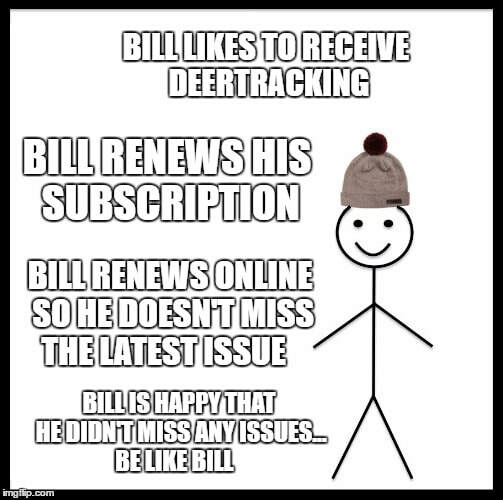 Contents (articles) in Deer Tracking are not to be reprinted or copied. They are for use in Deer Tracking Magazine only and permission is required in order to reprint or use otherwise. Due to the hard work and effort our writers put in to make Deer Tracking an enjoyable resource, we respectfully ask that you purchase the magazine if you would like a hard copy of articles. Thank you! Remember this Sire Timeline (1980-2009) from pages 28-32 in the last issue (Spring 2018)? We are still asking for readers to contribute pictures of notable sires that may be found in present day pedigrees. Send photos, DOB and name to us at ohdeer@xplornet.com Thank you to Shane Barks who spent endless hours and many many days researching and compiling this list, matching birth dates, pictures and names. This timeline will allow us to have a springboard to begin to also piece together (to the best of our ability) which are PURE Texas genetics, which are mixed and which are pure northern.